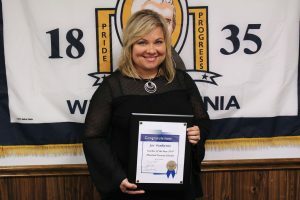 The West Virginia Department of Education (WVDE) has announced five finalists for the coveted West Virginia Teacher of the Year Award. The educators were selected from the 2018 county teacher of the year winners and represent excellence in the profession and dedication to students. This year’s finalists are: Adrin Fisher, Fairmont Senior High School, Marion County; Summer McClintock, Pleasant View Elementary School, Morgan County; Jada Reeves, Bradley Elementary School, Raleigh County; Clifford Sullivan, Mount Hope Elementary School, Fayette County; and Joy VanScyoc, Moundsville Middle School, Marshall County. The nominees include elementary, middle and high school educators from all regions of the state. Joy VanScyoc teaches rotational art at Moundsville Middle School in a year-long art studio course, and instructs a Project Lead the Way class called “Design and Modeling.” She sponsors an art club where students participate in school-wide activities including set design for school musicals, community art shows and competitions, and school-wide artistic designs for athletic events and activities. The opportunities given to her students have resulted in many local and regional awards. She also created a new chapter of the Technology Student Association that focuses on completing challenges and competing in various areas of science, technology, engineering, art and math. She has used art to transform the culture at her school and to build bridges with other schools and the broader community. The 2019 State Teacher of the Year will be announced on September 12, 2018 at the Embassy Suites in Charleston. The winner will represent West Virginia at the National Teacher of the Year Program.